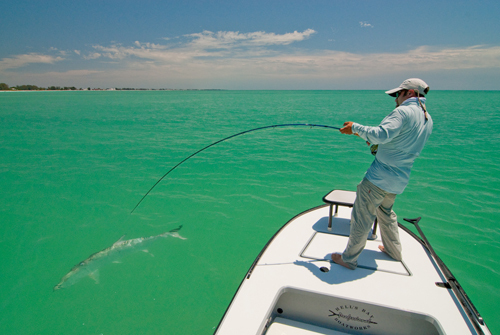 Tarpon Fly Fishing Guide Tampa Bay Sarasota St. Petersburg | Barbed Steel Charters, Inc. The tarpon is quite possibly the most perfect fish to catch using fly tackle. 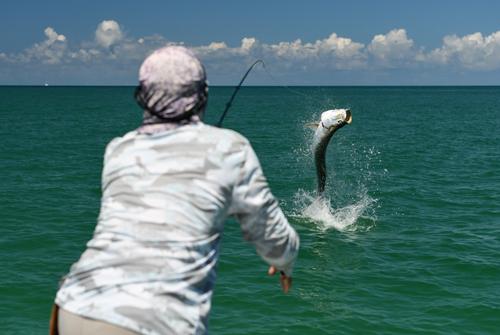 The tarpon possess sheer size, raw power, speed, a supreme jumping ability, and a never quit attitude that will test the angler to the very end. 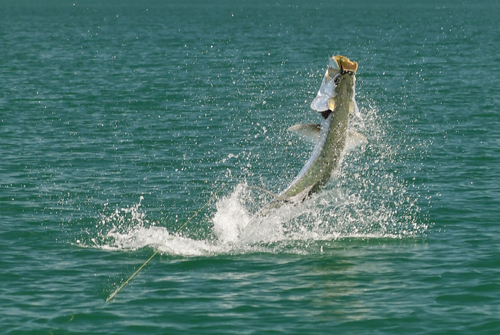 Tarpon also have the best take in fly fishing. It can range from a 5 ft. long silver flash beneath the surface of the water to a heart stopping follow culminating in a full on charge to eat the fly. Watching your fly disappear into the cavernous mouth of a tarpon at point blank range is one of angling’s great experiences. There is nothing like coming tight on a fish that won’t budge when you pull back, and the first minute or two after the hookup is an adrenaline charged rollercoaster ride you won’t soon forget. Though tarpon are year round residents, they are much more plentiful during the warmer months. 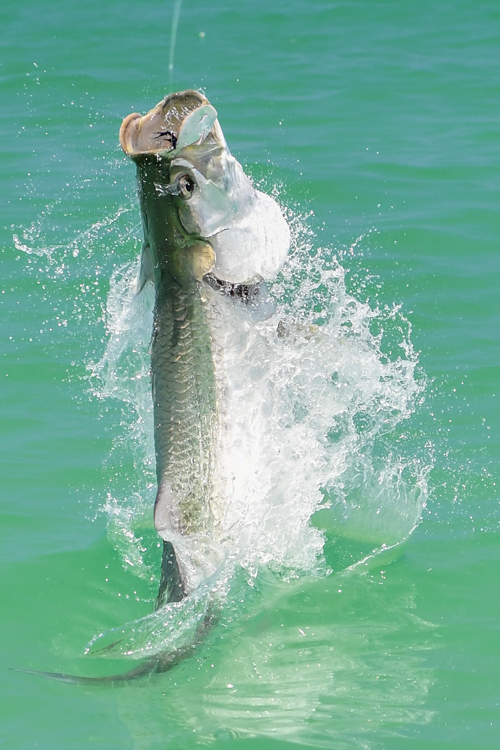 Starting in March, resident tarpon slip away from their deep water refuges and move toward the shallows to get warm. During calm, sunny afternoons, look for these resident fish to lay up and bask in the warm sunshine. These tarpon will float motionless just below the surface in an attempt to get warm. On occasions, they will stick their fins and even backs out of the water to gather in a little extra heat. A well placed fly just off their nose will often get slurped up in these conditions. As the season moves toward late April and early May, migratory tarpon start to show along west central Florida. This is when tarpon season kicks into high gear. The tarpon go on a feeding binge to help power them through the coming spawn. 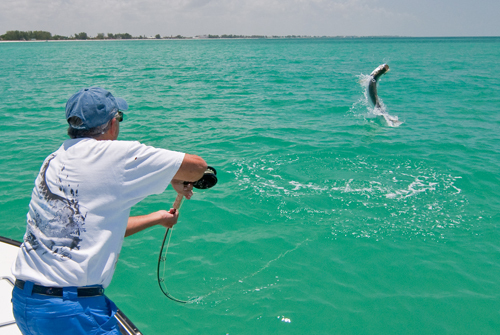 Late May through early July marks the time when tarpon are at their highest numbers. Spawning takes place offshore on the new and full moons during this time. On good days around the moons, one can see several thousand fish coming out of Tampa Bay and other passes along the gulf coast during the strong outgoing tides. As these fish cross coastal sandbars, we ambush them in an attempt to feed them a fly. This is the best time to get lots of shots at hooking up with the silver king. After the full moon in July, the large schools of tarpon begin to break apart. There will still be a few tarpon cruising the beaches, but their numbers become less as the season draws to a close. These late season fish enter the bays and backwaters to feed on the huge schools of baitfish before heading south for the colder months ahead. Targeting them is a little harder, but if you can get a fly in front of them, you generally will get a bite. The arrival of the first real cold front in October signals the tarpon it is time to leave for warmer waters to the south, only leaving the few resident fish to brave the winter in the deepest waters of the bay.